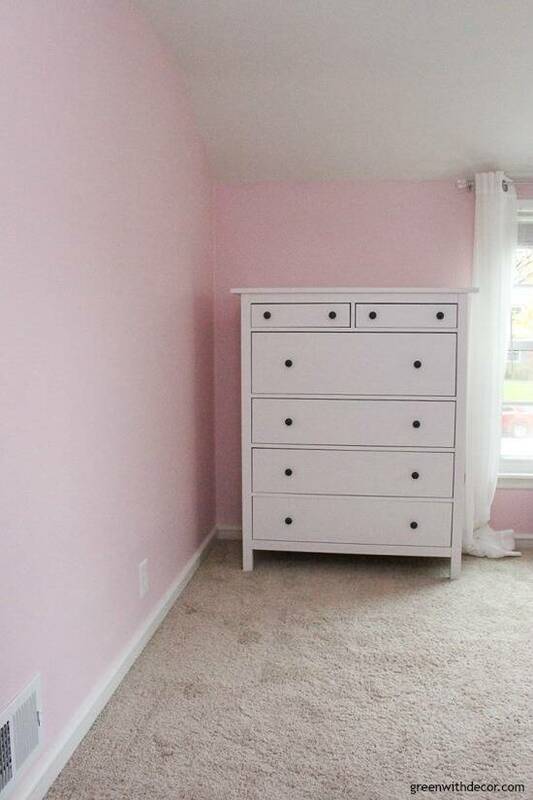 A great list of the best light pink paint colors for a nursery or little girls’ bedroom. I feel like it’s so easy to have a love/hate relationship with them. Find the perfect color and it’s the best, find a bad color and it’s a huge bummer. So began my hunt for the best light pink paint colors. We decided on Impatiens Petal by Sherwin Williams, but I figured I’d share a few of the other pink paint colors I looked at in case you’re on the hunt for the perfect pink paint color for a nursery or little girl’s bedroom, too! Because seeing pictures of real life rooms always helps me when I’m picking out paint colors. Here’s a peek at the pink paint color we chose! Do you have a favorite pink paint color? It’s amazing how many pink paint colors there are out there! Or if you’re looking for more paint color inspiration, I share my favorite grays, tans, white, blues, etc. on this painting tips page.